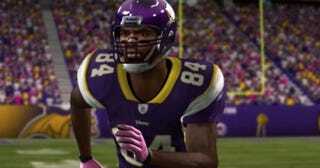 Interestingly, the trade sending Randy Moss to Minnesota boosted the Vikings' overall rating in Madden NFL 11 without diminishing the New England Patriots'. Not that this is necessarily a zero-sum game, but what gives there? New England, with no game this week, is now a receiving corps headlined by Wes Welker and Brandon Tate, with Alge Crumpler at tight end. Basically zero serious deep threat, in real life anyway. At launch, the Patriots were an 86-rated team. They since improved to 87 and remain that, post-Moss. Minnesota, which slid from 88 at launch to 85 last week, goes back to 87 overall with Moss' arrival. Moss also gets his old No. 84 jersey back. Moss, you might recall, went to the maximum allowable 100 in the "Spectacular Catch" attribute after a sensational week two grab in a loss to New York. Even so, this means his departure won't be missed in New England. I disagree, but, OK.
Other highlights of the latest roster (go to Online in your main menu, then select Roster Download from that console) include the Chargers Antonio Gates getting back to the coveted 99 overall rating thanks to a scorching performance in the first four weeks of the season. He's on pace for 96 catches and 24 touchdowns, as a tight end. But Titans running back Chris Johnson lost his 99 overall after a weak performance vs. Denver. In other news, EA Sports has declared this to be a double-coin weekend; in other words, you get double the amount of coins you'd normally earn for Madden Ultimate Team games and online games, ranked or unranked. Coins can be redeemed for scouting reports and Madden Moments Live.